Chuckie Egg - Just a quick release - I found the source to Chucke Egg at the weekend and ported it to the PSP. The Zip contains a README.PSP with keys and stuff. 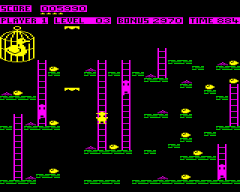 For those of you who have never heard of chuckie egg (is that even possible) its an early platform game made famous on the BBC B Micro. Its simple, but very addictive, even my kids with their new fangled graphics have enjoyed playing it.